The 2002–03 NHL season was the 86th regular season of the National Hockey League. Thirty teams each played 82 games. 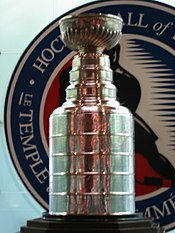 The Stanley Cup winners were the New Jersey Devils, who won the best of seven series 4–3 against the Mighty Ducks of Anaheim. This was the last season before the NHL switched home and away jerseys. As always the regular season saw several surprises. The San Jose Sharks, who many felt would be one of the elite teams in the West, stumbled early and badly and disassembled much of the team. The two-year-old Minnesota Wild, on the other hand, got out to an early start and held onto their first-ever playoff berth throughout the season, winning coach Jacques Lemaire the Jack Adams Award. The most surprising team was probably the Tampa Bay Lightning, which many had predicted to finish last, contesting for the Southeast Division title and making the playoffs for the first time in seven years. The most disappointing teams, other than the Sharks, were the New York Rangers, who finished out of the playoffs again despite bearing the league's leading payroll, and the Carolina Hurricanes, who finished last overall after a surprise run to the Stanley Cup Final the year before. On January 8, 2003, Chicago Blackhawks goaltender Michael Leighton gained a shutout in his NHL debut in a 0-0 tie versus the Phoenix Coyotes. Coyotes goaltender Zac Bierk earned his first career shutout, although it was not his NHL debut. It was the first time that two goalies in the same game both earned their first career shutouts. At the midpoint of the season the Canucks lead the Western Conference, and Ottawa lead the East. Vancouver stumbled somewhat over the stretch and lost the Northwest Division title to Colorado and the Western Conference one to Dallas. Ottawa continued to dominate, having the best season in franchise history and winning both the Eastern Conference and the Presidents' Trophy. The season was also marred by financial difficulties. Despite their success the Ottawa Senators were in bankruptcy protection for almost all of 2003, and at one point could not pay the players. Owner Rod Bryden tried a variety of innovative financing strategies, but these all failed and the team was purchased after the season by billionaire Eugene Melnyk. The Buffalo Sabres also entered bankruptcy protection before being bought by New York businessman Tom Golisano. The financial struggles of the Pittsburgh Penguins continued as the team continued to unload its most expensive players. The Stanley Cup playoffs was one of shocking upsets in the Western Conference and hard fought battles in the Eastern Conference. In the west, the first round was one of unmitigated shock to all hockey watchers. The defending champions and perennial cup favourite Detroit Red Wings were swept by the underdog Mighty Ducks of Anaheim behind the goaltending of Jean-Sebastien Giguere. After losing three out of the first four games, the Minnesota Wild came back and defeated the powerhouse Colorado Avalanche in game seven. Vancouver also lost three of its first four games with the St. Louis Blues, but then rallied and won game seven. The only round that surprised no one was round seven of the Dallas Stars-Edmonton Oilers grudge match that saw the first place Stars oust the Oilers with only some difficulty. 1As of 2008, this playoff game is the 19th longest NHL overtime game ever. 53 minutes and 34 seconds of overtime were played before Mark Recchi scored the game-winning goal. 2As of 2006, this playoff game is the fourth longest NHL overtime game. 80 minutes and 48 seconds of overtime were played before Petr Sykora scored the game-winning goal. March 11, 2003: Chicago traded D Phil Housley to Toronto for Calgary’s fourth-round pick in the 2003 Entry Draft (if acquired) or Toronto’s ninth-round pick in 2003 and fourth-round pick in 2004. March 11, 2003 - Chicago Blackhawks trade Steve Thomas to Mighty Ducks of Anaheim for 2003 fifth round draft pick (Alexei Ivanov). March 11, 2003 - Anaheim acquired C Rob Niedermayer from Calgary for Mike Commodore and Jean-Francois Damphousse.